So here’s a recipe for all the whingey whiners who complain that they don’t know what to have for breakfast when they ditch the bread and cereal. 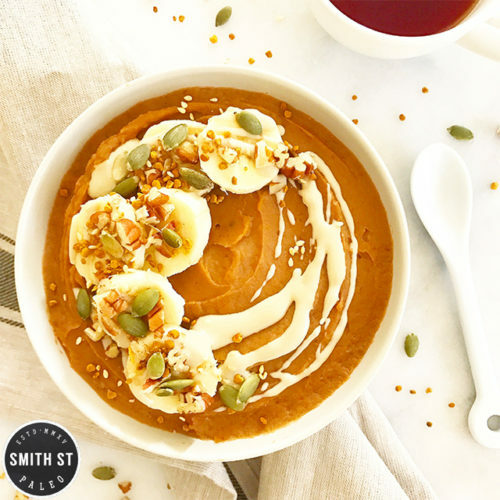 Paleo breakfasts don’t always have to be bacon and eggs you know (except why anyone has an issue with that I have no clue…) This is super simple to throw together if you’ve been clever and pre-cooked your sweet potato. Jazz it up with whatever you like on top and you have a super-filling, super-healthy and super-tasty Whole 30 bowl of awesome. Either bake your sweet potato whole in skin, or peel, chop and steam until soft. Mash the flesh once cooked (this can be done the day before to save time in morning). To the warm mashed sweet potato, stir in the banana and protein powder. Add the milk as desired to the consistency you would like. Garnish with fruit, nuts and seeds, nut butters, tahina, whatever tickles your fancy. TIP – I used Nuzest for the protein powder, its awesome stuff. It’s paleo, vegan, nut-free, dairy-free and with no processed sugars. It also tastes amaze! Not a plug, I just really like it.